The Ecuadorian part of the Amazon Rainforest has more than 9 reserves and national parks. It encompasses more than 11 % of Ecuador’s land mass. It’s by far the most biodiverse area in Ecuador with more than 800 species of birds, more than 2500 species of insects and more than 450 endemic flora. 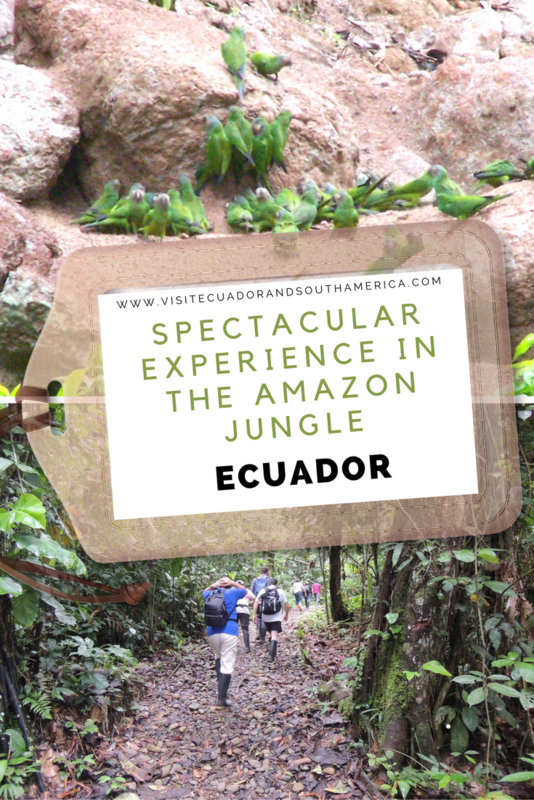 The Amazon Rainforest is a place to be visited during a trip to Ecuador. From my visits to the Amazon Rainforest in Ecuador, I would choose megadiverse Yasuní National Park. It is the best place for adventure and one of the most biodiverse areas on earth. The park is located 250 km east from Quito in the provinces of Napo and Pastaza and was declared a Biosphere Reserve by UNESCO in 1989. I really like the wide range of activities available in Yasuní. You can climb an observation tower to enjoy the rainforest canopy with all its bird species and lush green vegetation. Or experience gorgeous, brightly feathered parrots come to feed at the parrot clay-licks. The most rewarding way to explore the biodiversity of the Amazon jungle is on board a small canoe along the river to admire thick vegetation of all kinds and sizes providing home to reptiles, birds such as oatzin, toucans, monkeys and other species, trek to spot rainforest flora and fauna of all sizes and, if you’re lucky, spot a caiman resting on the side of the river. Now if you ask me from the lodges available in Yasuni, which one I recommend: I would suggest The Napo Wildlife Center or the Yasuni kichwa lodge (The community runs all operation and all profits immediately benefit the development this local indigenous tribe descending from the incas). Near both you will find clay licks you can visit during your trip to the Amazon jungle in Ecuador. What are clay licks? Visit Yasuní and you will definitely create some long-lasting memories surrounded by amazing natural landscapes in the Amazon jungle. Are you planning a trip there soon?